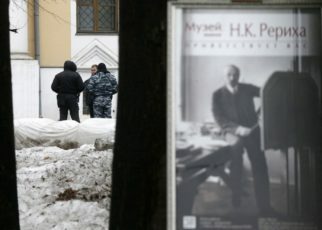 The ICR is in distress for the Federal Tax Service is claiming payment of 59 million rubles, which was not paid by the organization as a tax on the paintings donated by the patrons of the arts. If the amount is not found within the prescribed period, the ICR will face bankruptcy and sale of its property. The International Center of the Roerichs (hereinafter the ICR) is a non-governmental organization known not only in Russia, but also outside its borders. 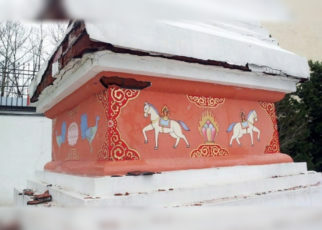 It was found by Svetoslav Roerich himself, who took this step in order to preserve and promote the heritage of his father Nicholas Roerich and other members of his family. 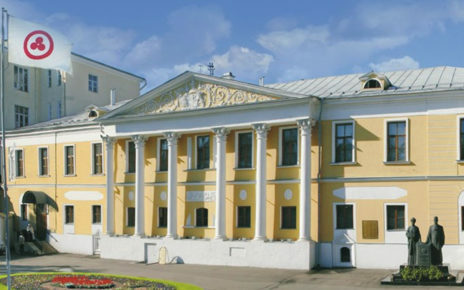 In the spring of 2017, the ICR lost its building located in the Lopukhins’ estate. But the Ministry of Culture decided to place there the State Museum of Oriental Art. Now the center is faced with new, equally serious, problems. Back in 2016, the Federal Tax Service, charged the organization with taxes in the amount of 59 million rubles. The center must pay this amount for the use of the Roerichs’ paintings in museum activities. This is an unprecedented case, because no museum pays taxes for exhibiting works of its funds. Indeed, the amount assessed by the tax authorities is completely impracticable for a non-governmental organization. The Ministry of Culture seized the Roerichs’ heritage together with the property of the ICR in 2017. As a result the organization has essentially lost the opportunity to realize its property and pay off tax arrears at the expense of this money. This might indicate the intentional bringing the ICR to bankruptcy, as well as the fact that the Ministry of Culture was interested in this. The tax authority, having made sure that the organization is currently not able to cover the full amount of its arrears, granted interim measures of protection on its property, commenced enforcement proceedings to offset its arrears at the expense of the ICR’s property and sent the relevant document to the bailiffs. On January 24th the Moscow Arbitration Court held a hearing on the lawsuit of the Federal Tax Service, according to which the Federal Tax Service required to adjudge the ICR bankrupt. The Center applied to the court to postpone the proceedings, and it was accepted. The meeting was postponed until April 2nd. If the ICR find 59 million rubles during this period, the Tax Service will enter into a consent decree. Thus, the ICR has about two months left to collect the necessary amount. Another way to solve the problem is to search for those (individuals or organizations) willing to put up the collateral sufficient to pay the debt. To date about 10 million rubles have been collected. The money was donated by those sympathizing with the ICR. Taking into account the penalties that are accrued on a day-to-day basis, it remains to collect 49.9 million rubles. If the amount is not found, the court will initiate the ICR’s bankruptcy proceedings. As a result, its property, including the Roerichs’ paintings, will be auctioning off. The center itself will be liquidated. And this is very likely what the Ministry of Culture of Russia has been seeking for a number of years. In this regard, the International Center of the Roerichs is requesting everyone who is not indifferent to the culture of Russia to support the ICR financially in order to prevent the sale of cultural property. This is the only way to save the ICR for it to go on restituting the Roerichs’ heritage and reviving the activities of the museum, destroyed by the Ministry of Culture. The information on donations can be found on the ICR website. 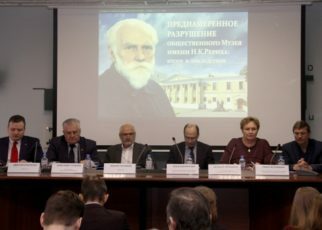 After the Director General of the non-governmental Nicholas Roerich museum and the executor of Svetoslav Roerich’s will Lyudmila Shaposhnikova died in 2015, the Ministry of Culture, according to the ICR, began its endeavors to liquidate the center to appropriate the Roerich’s heritage. During this period, a number of serious events relevant to the fate of the ICR occurred. 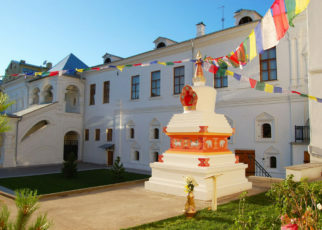 The Ministry of Culture actually destroyed the museum, having captured its territory that of the Lopukhins’ estate together with the Roerichs’ heritage. 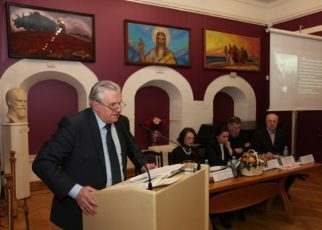 On March 7–8th staff members of the Ministry of Internal Affairs (numbering sixty) and those of riot police, together with the representatives of the Ministry of Culture and the State Museum of Oriental Art appeared in the non-governmental Nicholas Roerich museum. 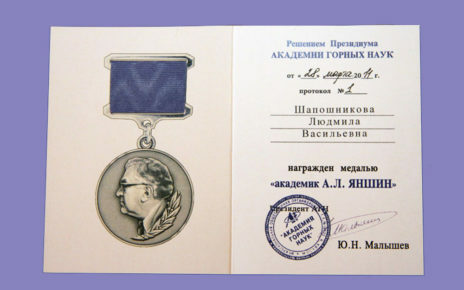 The case of “Master Bank”, the President of which Boris Bulochnik was supporting the center as a philanthropist for many years was the cause of this visit. They smashed the front door with a sledgehammer, blocked the guard and rushed inside. The building was searched, after which the law enforcement officers took out about 200 exhibits from the museum, according them the status of corpus delicti. Subsequently, all the items were transferred to the State Museum of Oriental Art for safekeeping. 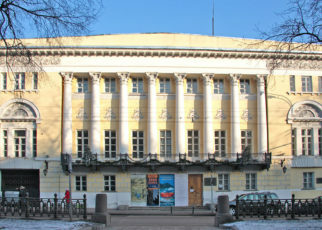 At that, the Ministry of Culture claimed that their department was irrelevant to the March events, occurred in the Lopukhins’ estate, and their representatives were present at the withdrawal of exhibits only as “experts.” The leadership of the ICR draws attention that not only the pictures donated by Bulochnik were transferred to the State Museum of Oriental Art. The items that have no relevance to the patron were also subject to confiscation. Although, according to the official version, the withdrawal was connected precisely with the criminal case initiated against the banker. After this episode the materials discrediting the activities of the ICR began to appear in mass media. On April 28–29th, 2017 the Lopukhins’ estate was seized. On April 28th the director of the State Museum of Oriental Art A.V. Sedov accompanied by law enforcement officers in uniforms without military insignias, came to the territory of the ICR. The entrances were blocked, and the museum staff was deprived of access to their workplaces. No documents justifying such actions were provided. 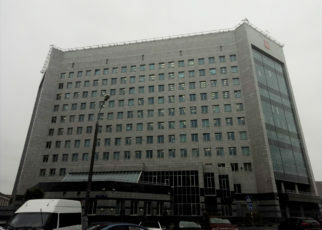 Private security and police intervened in the situation, but on April 29th the officials of the Ministry of Culture and the special police units joined in. The estate was seized, and all cultural values, documents and the ICR’s property were transferred for safekeeping to the State Museum of Oriental Art. Neither takeover certificates nor inventory of transferred property were compiled in this case. The non-governmental Nicholas Roerich museum was actually destroyed. The unique exposition, being created for twenty years, was lost. A part of the museum equipment and exhibits were damaged. Their subsequent restoration is impossible. The ICR does consider the incident a raider seizure. After that, the Ministry attempted to liquidate the ICR, accusing the organization of conducting extremist activity and violating the requirements of the registering body to amend the organization’s charter. However, these attacks could not destroy the ICR. And then the Ministry undertook such measure as adjudging the organization bankrupt. With that, before the Tax Administration decision for the ICR to pay the tax in the amount of 59 million rubles came into force, the leadership of the Ministry of Culture and the State Museum of Oriental Art seized all the property of the ICR. Thus, in the present context this means a forced bringing the organization into a state of bankruptcy. 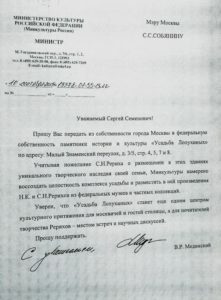 Before the capture of the Lopukhins’ Estate and all subsequent events the Minister of Culture of the Russian Federation Vladimir Medinsky wrote a letter to the Mayor of Moscow Sergey Sobyanin, dated September 10th 2015. In it, the head of the Ministry of Culture requested the Mayor to transfer the Lopukhins’ estate from the property of the city of Moscow to the federal one. 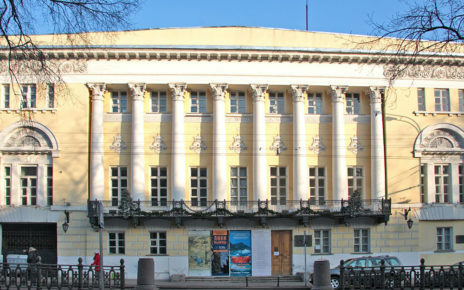 He emphasized that the Ministry of Culture intended to “re-construct the integrity of the estate complex and locate the works of Nicholas and Svetoslav Roerichs from federal museums and private collections in it, so that in the future it would become a “center of cultural attraction for the citizens of Moscow and the guests of the capital” and “a venue for meetings and scientific discussions” for all Roerichs’ admirers. 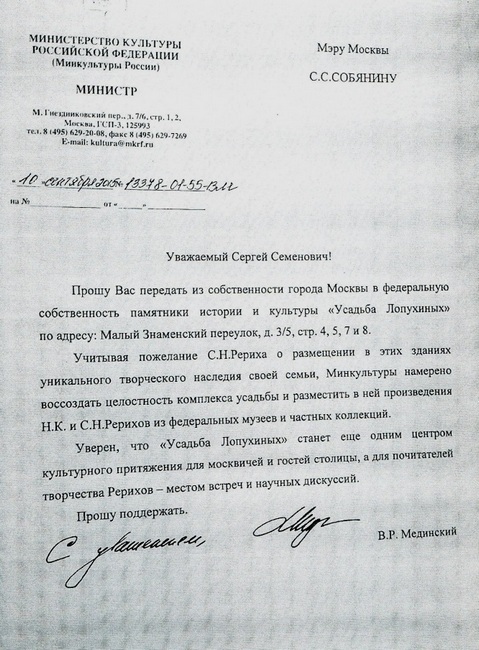 Medinsky pointed out that the plans of the Ministry of Culture regarding the estate corresponded to the wish of Svetoslav Roerich about locating the heritage of his family there. A month later, the estate buildings were transferred to federal property. Immediately after, the Federal Agency for State Property Management transferred the above – mentioned objects to the operational management of the State Museum of Oriental Art for the State Museum of the Roerichs to be established there as its branch. 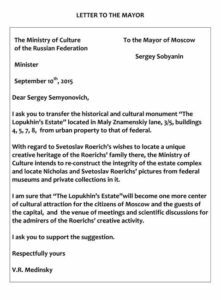 In February 2016, the Ministry of Culture approved the concept of the State Museum of Oriental Art to create the State Museum of the Roerichs in the area of the non-governmental Nicholas Roerich museum. At that, the officials were not at all disturbed by the fact that these actions contributed to the apparent destruction of the non-governmental organization, and grossly violated the will of Svetoslav Roerich, who believed that such a museum could exist only in a non-governmental status. 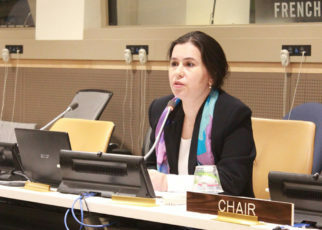 However, as the Vice-President of the ICR A.V. Stetsenko noted in his article, it was commonly understood that the Ministry of Culture was not going to create a State museum of the Roerich family in the Lopukhins’ estate, and all the promises of Medinsky and the leadership of the State Museum of Oriental Art, due to which the Roerichs’ heritage transferred to Russia would be allegedly collected in this place, were untrue. At the moment there is official information that in 2019 the estate will be closed for refurbishment. According to mass media with reference to the director of the department of museums of the Ministry of Culture, Vladislav Kononov, the object will subsequently be transferred to the joint use of the State Museum of Oriental Art and the Pushkin State Museum of Fine Arts. 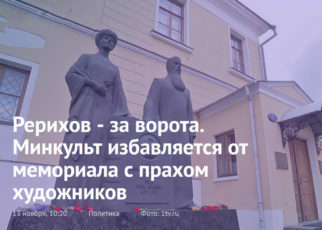 Currently, according to the official, the staffs of both museums, lacking exhibition space, are working on the concept of collaboration in the premises of the Lopukhins’ estate. V. Kononov warned that the process of placing the above – mentioned museums there will be delayed for two or three years. “It was the largest non-governmental museum in our country. I say was because, unfortunately, the Ministry of Culture in 2017 began to destroy it and was a success in it. All the pictures, the entire archive, all materials of the Roerich family were taken out of this museum. Now all this is stored in the State Museum of Oriental Art. But whether all the items are there, no one knows. No one can see them today either. As for the State Roerichs’ Museum, a space for it will be allotted to the State Museum of Oriental Art at the Exhibition of Achievements of National Economy. Although at first such plans were not aired. 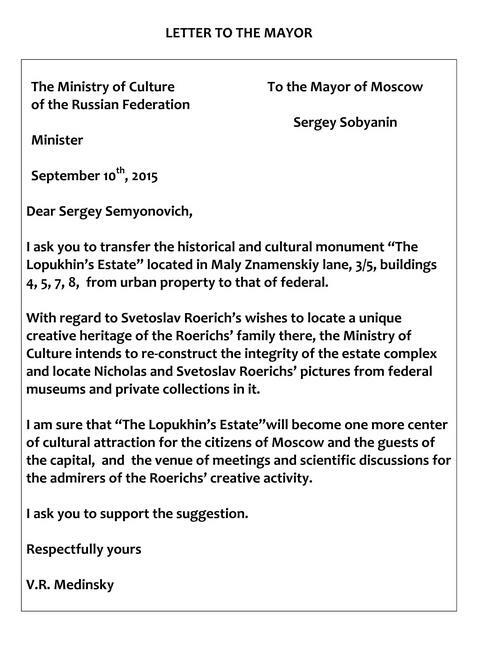 The requirement of the State Museum of Oriental Art to remove the Roerichs’ monument and the Roerichs’ busts from the territory of the estate has become one more confirmation that the Ministry of Culture intends to purge the people’s mind of any memories that there ever was the non-governmental Nicholas Roerich museum. By the way, the second term of Svetoslav Roerich’s agreement when transferring the heritage of his family to Russia was to provide the ICR with the necessary buildings in Moscow, from which he himself chose the Lopukhins’ estate. Thus, the Ministry of Culture violated this condition also. The question arises why it was impossible from the very beginning to create a new State Museum at the Exhibition of Achievements of National Economy. Was there any necessity to destroy the non-governmental Nicholas Roerich museum? And why did they need to mislead the Mayor of Moscow and the wide public? The ICR believes that the leadership of the Ministry of Culture, together with the State Museum of Oriental Art has been conducting a focused and systematic struggle against the Roerichs’ heritage. And it’s still early to talk about its completion. 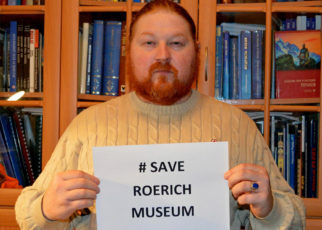 The ICR representatives have already appealed for help to the country’s top officials, asking to stop the outrage that has been happening in relation to the non-governmental Nicholas Roerich museum. The ICR has launched the virtual project “The Museum that Russia Lost”. On the site you can see the exposition that was presented in the Lopukhins’ estate. The exposition was created thanks to the support of patrons and the public. It included paintings, books, personal belongings, photographs and archival documents of the Roerichs’ family. In addition, there is a chronicle of the Museum destruction, which, as noted on the site, can be regarded as one of the world’s largest crimes against Culture.